Above are some images from the Hart Island tour orientation slideshow. A tour of historic Hart Island (including Potter's Field), the Bronx, was conducted Thursday, June 15, without charge, by the NY Correction History Society (NYCHS), through the good offices of the NYC Department of Correction (NYC DOC) and in conjunction with the June 15-17 Conference on New York State History. 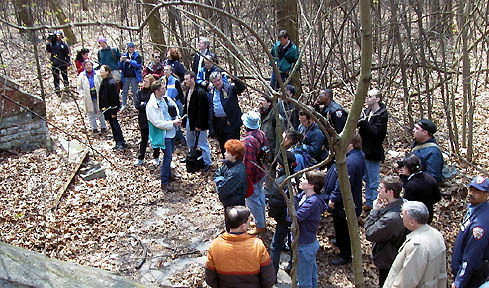 A scene from the April 27th Hart Island history tour, the first ever held. Read that tour's story and view its photo album for orientation. See also June 15 tour participant Mike Harling's virtual tour album. The morning Hart Island tour concluded in the early afternoon so state history conference participants taking the tour could attend the conference's registration and first session starting later that afternoon on Fordham University's nearby Bronx Rose Hill campus. About half the tour participants drove their own vehicles to the City Island ferry slip on Fordham St. and found nearby street parking. Private vehicles are not permitted on Hart Island. The bus bringing tour participants from NYC DOC's Hq was used on Hart Island to shuttle people between points of interest. The tour was open to New York correction professionals with an interest in the history of their field as well as open to academicians, graduate students, historians, genealogists and serious researchers. While the tour was being arranged in conjunction with the June 15-17 Conference on New York State History, registering for the conference was not a requirement for taking part in the tour that was offered without charge. Those on the tour bus return trip who did not participating in the conference were driven back to NYC DOC's Hq in Manhattan or dropped off at a subway station at their request. The June 15 Hart Island tour was just the latest in a series of activities set in motion by an initiative launched under the previous NYC Correction Commissioner, Michael P. Jacobson, and expanded under the current Commissioner, Bernard B. Kerik. The initiative seeks to recover, preserve and promote correction history in New York with the help and participation of the academic community. Professor Jacobson, now with John Jay College of Criminal Justice and the CUNY Graduate Center, is president of the New York Correction History Society; Commissioner Kerik, its board chairman. The conference is an annual meeting, organized by an informal group of academic and public historians and held at different locations around the state. More than four decades after its initial incarnation, the conference continues to serve as a forum for new historical scholarship and for the discussion of related issues open to all in the New York historical community. The conference is largely self-sustaining but relies on the institutional support of the New York State Museum through its Colonial Albany Social History Project and the New York State Museum Institute for basic administrative services. Cornell University, the New York State Historical Association, and the New York State Archives are the other institutional sponsors. The state history conference program is formed in response to proposals received from a call for papers issued in the fall. Each year's program aims to represent New York's historical diversity while seeking chronological, geographical, and topical balance. The conference accords special consideration to understudied topics, first-time presenters, and local government historians. The June 15-17 conference 2000 Program is available on the Conference on New York State History web site.